Years of research and development in the laboratory and on the race tracks have produced a masterpiece of sports eyewear: called ProFlow ™, it is the flagship product of the Rudy Project Concept collection. Eyewear that stands out immediately by the ideal balance between performance, combination of materials and style, as well as the exceptional Rudy Project ergonomic solutions. 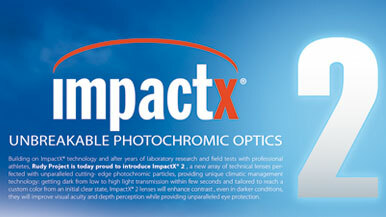 ImpactX lenses change shade when the light conditions vary and are unbreakable to protect your eyes. Safe,cool, practical! 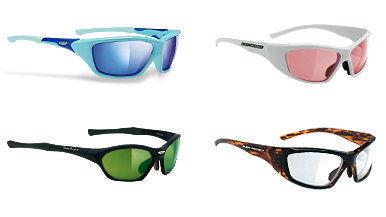 Rudy Project eyewear are totally adjustable to assure you a perfect fit on the face and total comfort. Danger can be right around the corner in training as well as in competition. Protect yourself with Rudy Project eyewear! A Rudy Project eyewear will assure you the perfect mix of Italian Design, functionality and innovation. Rudy Project has selected the most advanced materials to offer you performance, resistence and lightness.